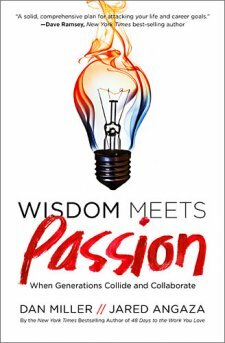 Wisdom Meets Passion is a book that offers vocational guidance for those who might be looking for a first job or for someone who might be looking for a more fulfilling career. The author, Dan Miller, is the creator of the popular book and website 48 Days to the Work You Love. Jared Angaza is his son, who has lived his life based on many of the ideas that are advocated in this book. The chapters are written mostly by Dan, with occasional comments inserted by Jared. The main point of the book is that if you combine your wisdom with something you are passionate about, you will be able to find fulfilling, meaningful work that will be more rewarding to you than any high-paying job could ever be. There are chapters on things like making a difference, discovering why you're here, and sharing the wealth. While this book does have some good points, I felt that overall it was impractical. It's all very well and good to tell someone that they need to find fulfilling work and that volunteering and internships are the way to go, but the very practical matters seem to be glossed over. The author mentions such admirable figures as Bono, Mother Teresa and Angelina Jolie as people who have done marvelous things with their humanitarian works, but I doubt any of those people had to worry about keeping a roof over their heads or where their next meal was coming from. The father is very proud of his non-conformist son, who picked up and moved to Africa, but the son himself talked of having a "big network of friends and family to take care of us." The author also seems to have somewhat negative views of traditional education and useless college degrees. While it might be true that there are many people who graduate with high student debt and no clear career path, it seems somewhat irresponsible to counsel people to "identify 30 or 40 companies" you'd like to work for, contact them 3 times each, and "God will provide a job." He does state numerous times that people should have a plan and take definite steps to put the plan into motion, but there is an awful lot of suggestion that if you "do something you love" that money will just miraculously show up. I'm really surprised that the practical Dave Ramsey endorses this book and philosophy so highly! While this book might be useful to someone who is financially stable and suffering from a career crisis, I don't think any desperate, unemployed person will receive much practical advice from it. For more information about the book, please visit the Wisdom Meets Passion product page. Disclaimer: BookSneeze® provided me with a complimentary copy of this book in exchange for my review.